I hope you enjoy the different hacks I am showing here. If you need to take a break from painting…wrap tray, roller, brush in a plastic bag and put in fridge. Pitching Machine for home use: Practice hitting wiffle balls with this pitching machine. Take your leaf blower ..Place a T Joint on to the leaf blower.Secure with duct tape. Then take a 2′ pipe and stick it into the T Joint for the ‘muzzel’ . Then stick a pipe and put onto the top of the T Joint for the ‘loader’.Set the pitching machine on a table, on top of pillows or bean bags to adjust the machine to shoot up slightly. There you go. Turn on the blower, load the balls…watch them go. Take a clean empty wine bottle, fill with water, stick neck down into the soil of a potted plant. This will water plant when thirsty. Keep your lint from the dryer. You can stuff it into a empty toilet paper roll and use as a fire starter for your fire pit. To brighten your teeth…Mix baking soda and lemon juice in a small bowl. Take a Q Tip and dip it in the mixture and apply it to your teeth. Want to make a really fun and easy fort for your children? All you need is some tape, a box fan and a sheet. Fold the sheet in half lengthwise. Place the top of the sheet on top of the box fan and tape it toward the back. With the box fan sitting on the sheet, turn on the fan, and it makes a marshmallow like tunnel…Just be sure the children are old enough not to put fingers inside fan. Upset Stomach? Eat a piece of burnt toast, and soothe stomach acid, and no more tummy ache. Elevating you monitor a bit will give you better posture. Homemade wax hair removal. 1 cup sugar 2 TBSP Lemon Juice, 2 TBSP of water. Bring to boil stirring constantly. Once it has the consistency of honey, remove from heat, let cool 15 minutes, and there you go. Doesn’t work on real coarse hair. Great for Brazilian waxing. Get Pills off sweaters, even wool sweaters….Try rubbing your sweater with a pumice stone. It removes the pills fast. Ground coffee is a great pick -me- up for you garden also! Need more ‘free’ coffee grounds? Pick up at your favorite coffee store. They keep used coffee in bags, then toss. They are glad to give to you! If you have washed your sweater and it shrunk, here is a great hack. Fill sink with water. Add hair conditioner and let it soak. Wring out. And lay flat on a towel. The conditioner softens the fibers, which you can stretch it back to original size without ruining sweater. Make hard boiled eggs easier to peel when cooked. Add baking soda to the water before boiling. Do you sit all day at work or home. Replace uncomfortable office chairs with a large fitness ball. Not only will it be comfortable, but good workout for your abs. Don’t have a Panini press? Take 2 frying pans, one larger than the other. Place the larger one on the heat and spray with cooking oil. Place your sandwich in the hot pan. Take your smaller pan, and place on top of sandwich. Then take something heavy, like a bag of sugar or flour, and place on smaller pan. Cook 2 minutes on medium heat. Then flip your sandwich over with spatula, and cook another 2 minutes. There you go…a Panini sandwich. I love this one!! 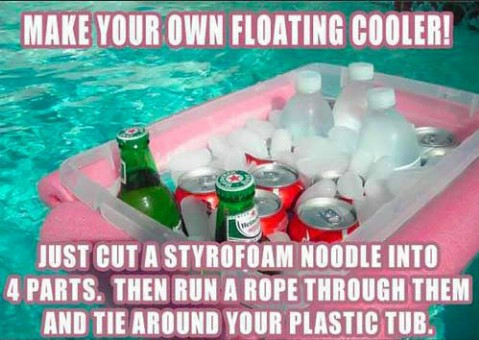 So great for all your parties and just for relaxing out by the pool. Never have to have to run in the house to get a cold drink….what a great idea. This is one I am stealing…I get so many of these hangers and hate to throw out.. Cleaning the baseboards…this is a good idea..
Well, I hope you enjoyed these ideas….if you have any hacks for around the house…please comment and I will add to the list!!! GREAT IDEAS !! THANK YOU, KELLY!! Thank you so much Ron!!! What a great list! Thanks for all the great idea!